Carrie Shipers’s Cause for Concern traverses a landscape of assorted disasters—such as overwork and layoffs, the ill-fated explorer, circus mishaps, nuclear disaster and radiation—but at its heart is the personal disaster of spousal illness. While a spouse might avow faith in the sentiment of love in sickness and in health, the practice of such faith might come undone when faced with the reality of the ravages of illness on the stricken body of the beloved, alongside the caregiving mate who “could love/ [her] husband but distrust his body,/ expect betrayal at every turn.” Full of incisive meditations on frailties and fortitude often delivered with visceral honesty, Cause for Concern is spellbinding from start to finish and, deservedly, the winner of the 2014 Able Muse Book Award for Poetry. 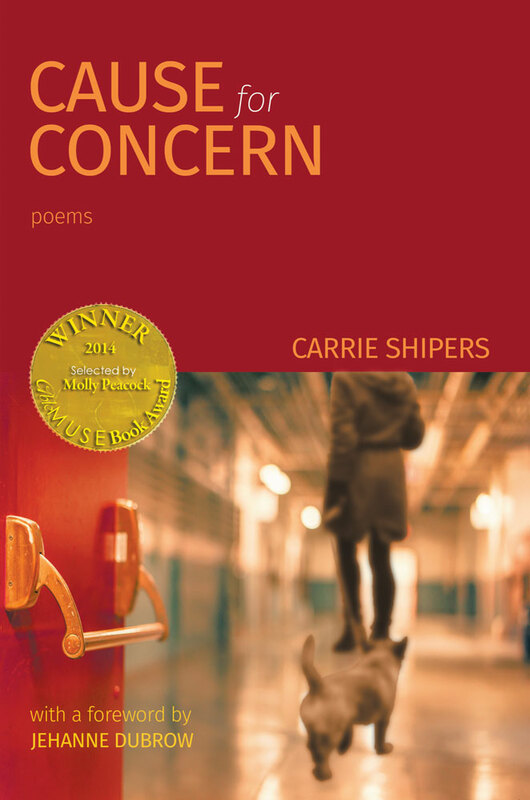 Carrie Shipers’s magnificent endeavor aims to control the uncontrollable. In her splendid collection Cause for Concern she gives us her spirited poems—subversively satisfying in our era of cool wordplay. Both her comfort with ambiguity and her sassy candor aid the poet as she writes of a wife who is hoodwinked into a necessary patience—one she both chafes from and rebels against after her husband falls seriously ill. In rhythms that alternate between hope and defeat, the poems track the illness, but also punctuate the couple’s changed world with quirky observations and a scrappy spirituality. (Not to mention a canine companion.) Her poet’s craft, palpable in every arresting line, makes the subtlest turns of vulnerability with enviable poise. Only a poet of unquestionable bravery and technical acuity could rehearse the quotidian details of a middle class, middle aged existence with such exquisite, irresistible and terrifying honesty. 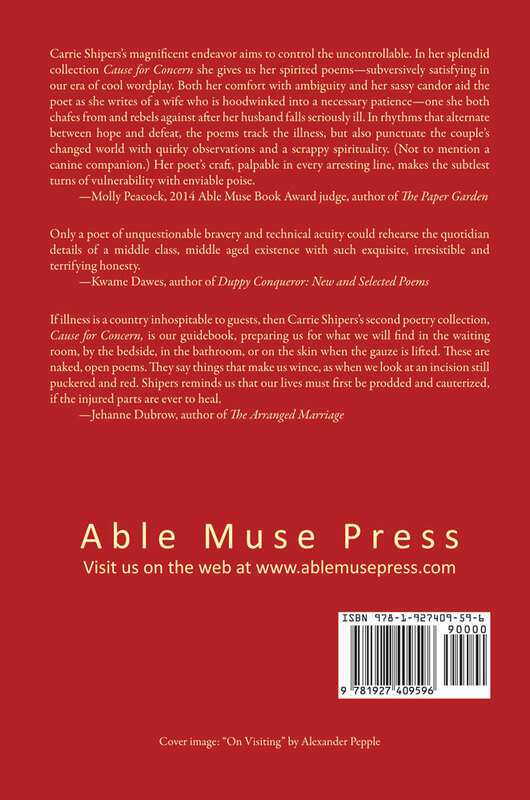 If illness is a country inhospitable to guests, then Carrie Shipers’s second poetry collection, Cause for Concern, is our guidebook, preparing us for what we will find in the waiting room, by the bedside, in the bathroom, or on the skin when the gauze is lifted. These are naked, open poems. They say things that make us wince, as when we look at an incision still puckered and red. Shipers reminds us that our lives must first be prodded and cauterized, if the injured parts are ever to heal.